What do we want? 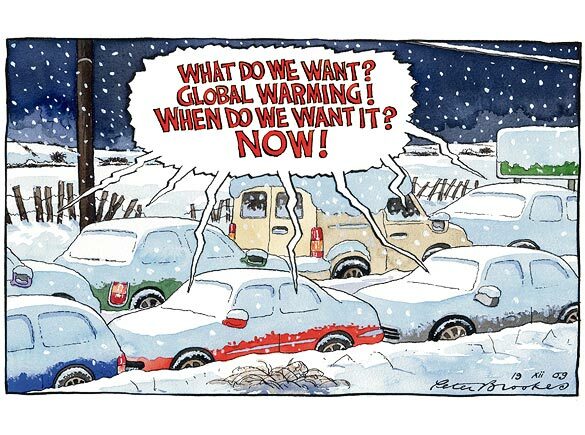 Global Warming! When do we want it? NOW! Weather is climate! Climate is an mathematical statistical abstraction. Weather is what is really happening now. Climate is arbitrary math. Nature knows no bounds and isn’t limited by man’s (or Mann‘s) understanding of complex weather systems. Many records of cold temperatures and record snow falls are currently being broken during this fall and winter season, often with low temperatures not seen in decades. As someone who lives in the Great White North I certainly wouldn’t mind it a few degrees warmer. Oh, come back to us Global Warming, it’s too soon for the planet to cool down again. This entry was posted on December 20, 2009 at 3:48 pm	and is filed under Ethics in Science, It's weather AND climate!, Video. You can follow any responses to this entry through the RSS 2.0 feed. You can leave a response, or trackback from your own site.